I get lots of wild ideas. Wearing white after Labor Day. Getting a new haircut six days after giving birth. But this idea was pretty wild for even for me. 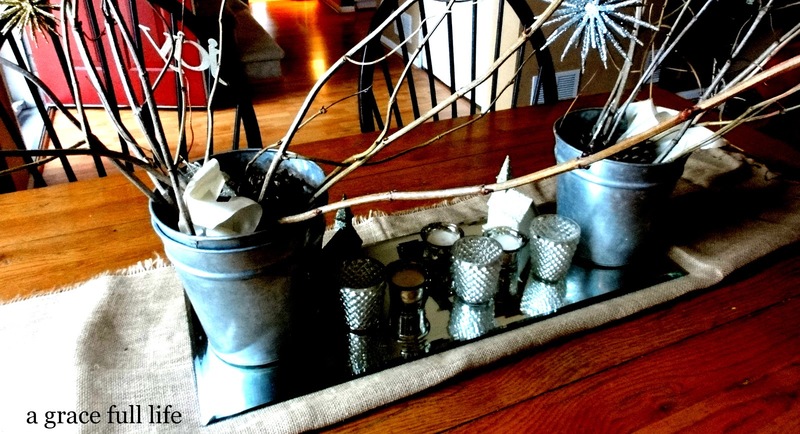 I wanted to create a holiday table with only Dollar Tree or dollar store items. These galvanized buckets were given to me by my neighbor this summer. The “joy” ornament is from a package of five from Dollar Tree. The ornaments on the branches? The burlap is from Hobby Lobby and I did absolutely nothing to it. Well, I folded it over. The mirror that everything is sitting on I got at a garage sale two years ago for one dollar. The pine cones are from Dollar Tree as well and that ivory satin ribbon is a remnant of what I used for the burlap wreath my friend Rebecca made for me earlier this fall. 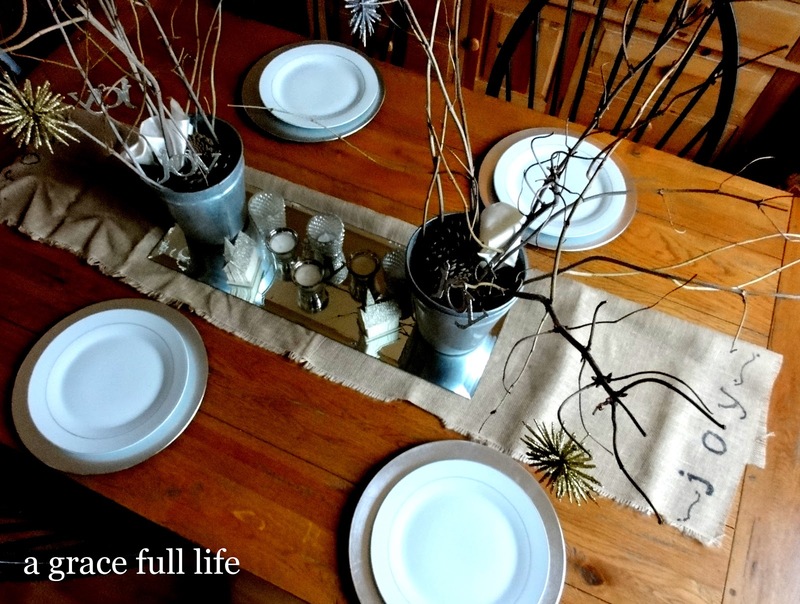 The table setting is under six bucks for the whole thing. The chargers I got at a local department store after Christmas last year for 30 cents each. 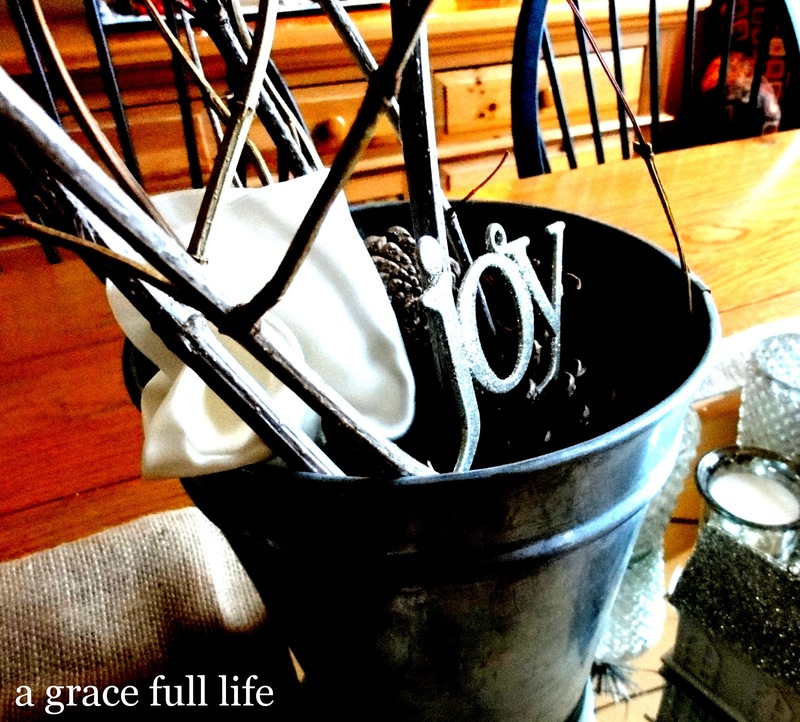 I used a sharpie marker for the burlap runner on the table and wrote JOY by hand. I know, you are wooed by my creativity. The branches are courtesy of my snowball bush in my backyard. I wanted something natural and less red and green for my table this year. I really love how this turned out. 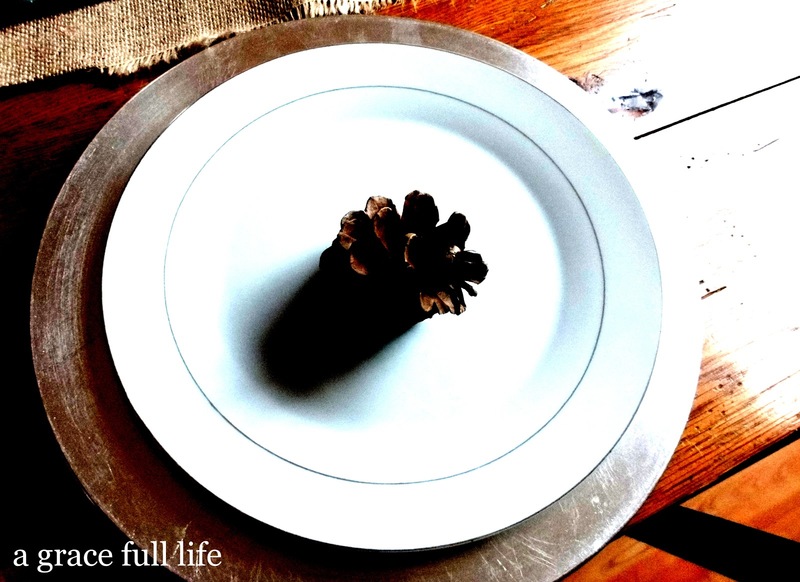 A simple pine cone as a placeholder or to top a napkin on each plate. Here it is lit up at dusk. The little churches are ornaments from a big box store for $1.97 each. 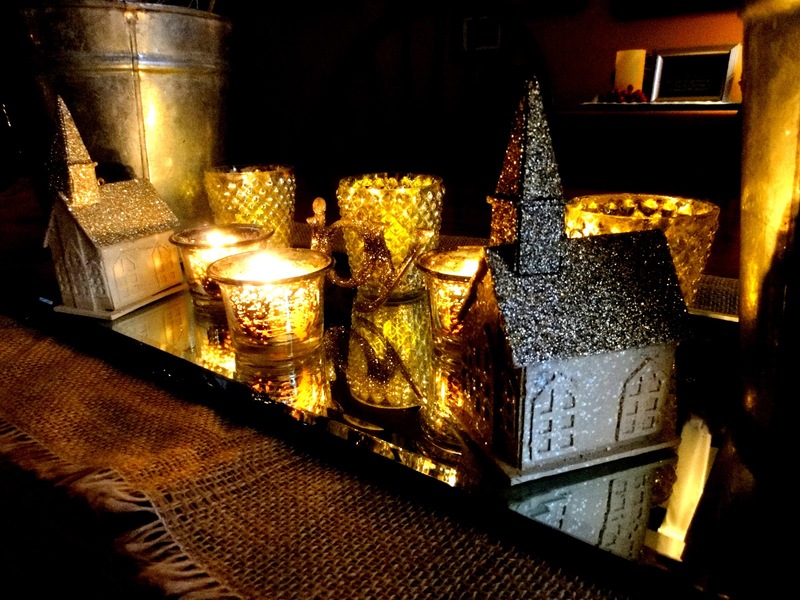 The small mercury glass looking votive candle holders are from a cute little store called Jeffrey Alans and I got them for only 97 cents each. 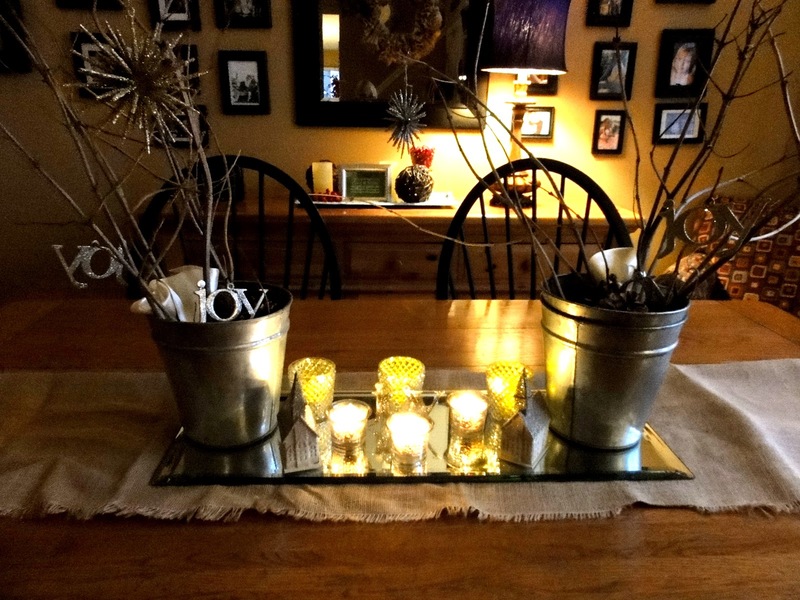 The larger candle holders are from Pottery Barn and were $3.50 each…a little pricier but the cheapest thing you will ever find in that store. 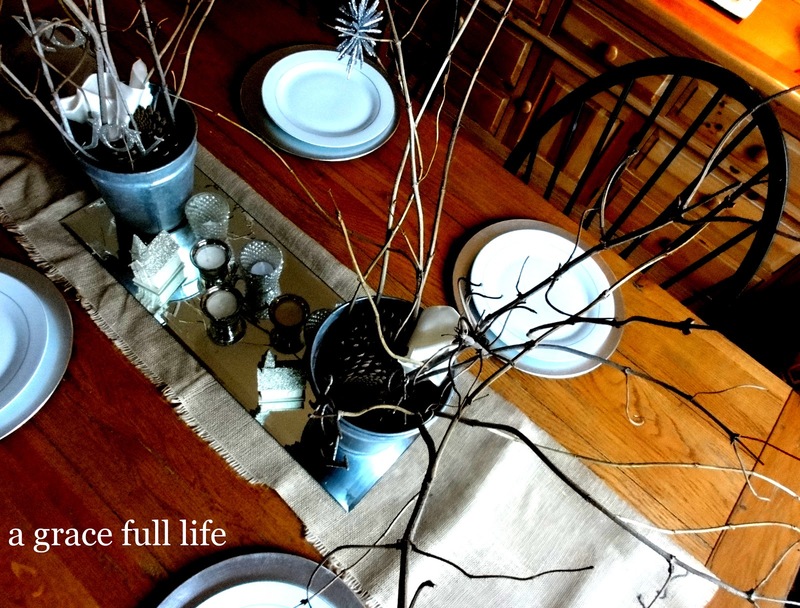 This tablescape brings me joy just looking at it every day. – branches– Thanks Mother Nature! – galvanized buckets– Mine was free thanks to my neighbor but Amazon has amazing ones to choose from. – JOY ornaments– $1.00 for a package of five at Dollar Tree or click on the link to head to Amazon. 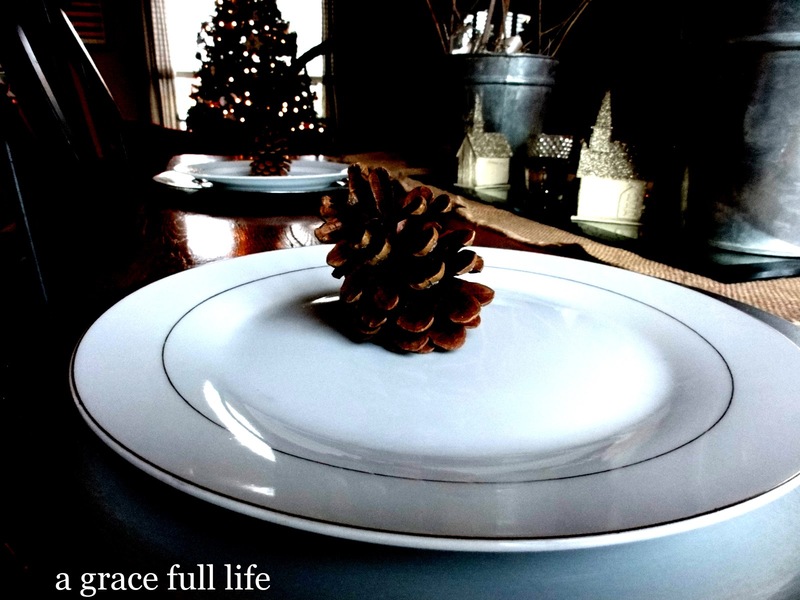 – pine cones– These are available seasonally at Dollar Tree. 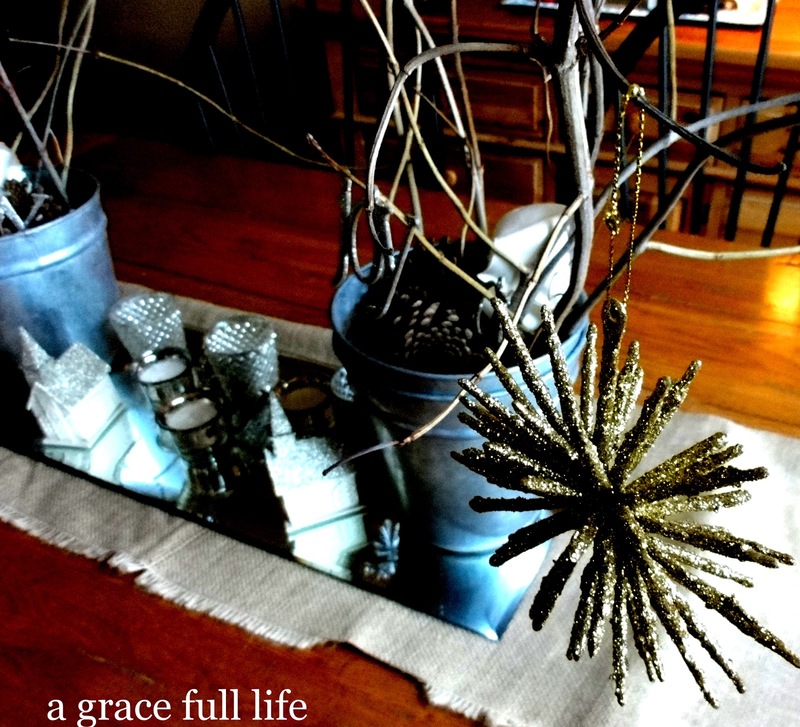 – star-like ornaments hanging from the branches– $1.00 each at, where else? Dollar Tree! They most likely don’t have them any more but Amazon has ones that are very similar. 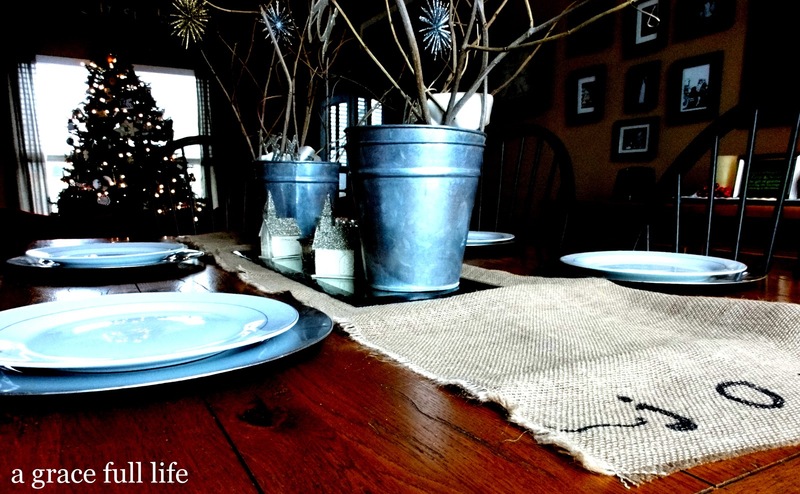 – burlap– got it off the roll at Hobby Lobby but I love the runners that are now available and they are much more reasonable than creating your own. – little church ornaments– $1.97 each at Wal-Mart but they don’t carry them any more. Amazon does, however, so click the link to find them. 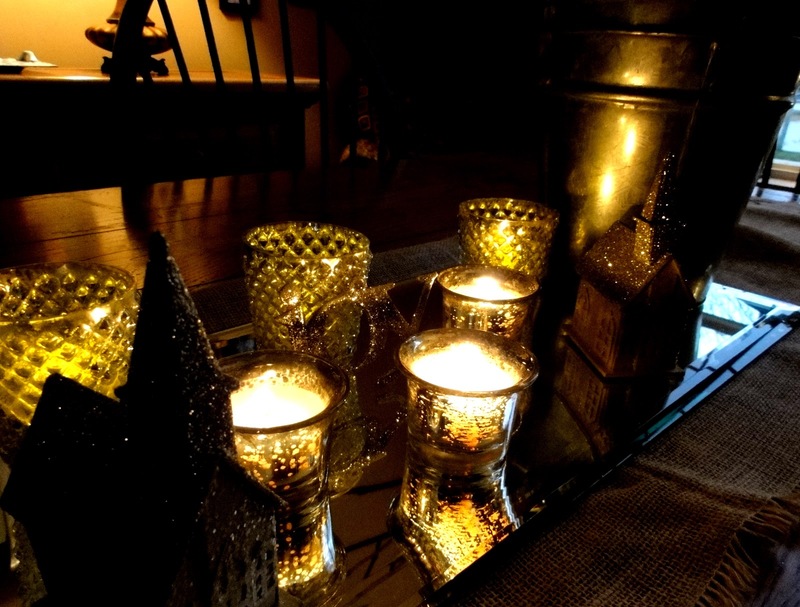 – small mercury glass candle holders– I bought mine years ago when mercury glass was HUGE but the prices were HUGE as well, You can now find packs of six or more on Amazon for amazing prices. This is my favorite. 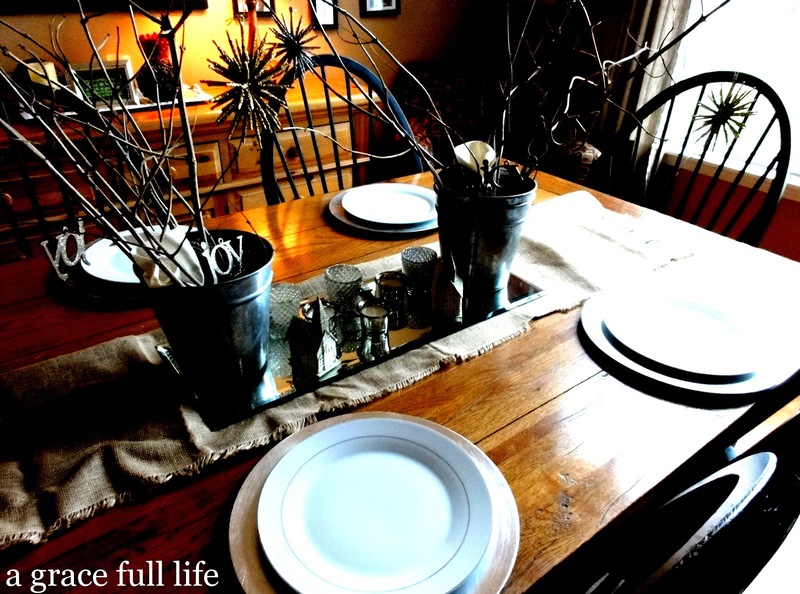 – white plates– $1.00 each at Dollar Tree *they still have these, so get in there now! – silver chargers– 30 cents each after Christmas sale last year at Wal-Mart but that was a rare find. I adore these chargers at Amazon (hurry, they sell out FAST in this style). I hope you enjoyed this and I also hope it can inspire you to create something cool from items you already have laying around! Head over here for more of my Dollar Tree crafts! Yes it does need some mulled wine doesn't it……:) Thanks friend! I love the natural simplicity of it! Very pretty. Stopping by from Centsational Girl. @ P and D- Thanks so much! @ Linda- thanks for stopping by for the first time, I hope you come back! Absolutely beautiful!! I can't believe that most of the stuff you got for so cheap!!! The way you put it all together makes it look like you spent WAY more money than that. Nice job!! 🙂 Thanks for linking up to Strut Your Stuff Saturday! We hope that you will come back tomorrow and share more of you amazing ideas! This is so beautiful & unique. I love it. What a great project. Thank you so much for linking it to Fabulous Friday. @ Camille- thanks so much! @ Michelle- Thanks so much too!! Gorgeous! 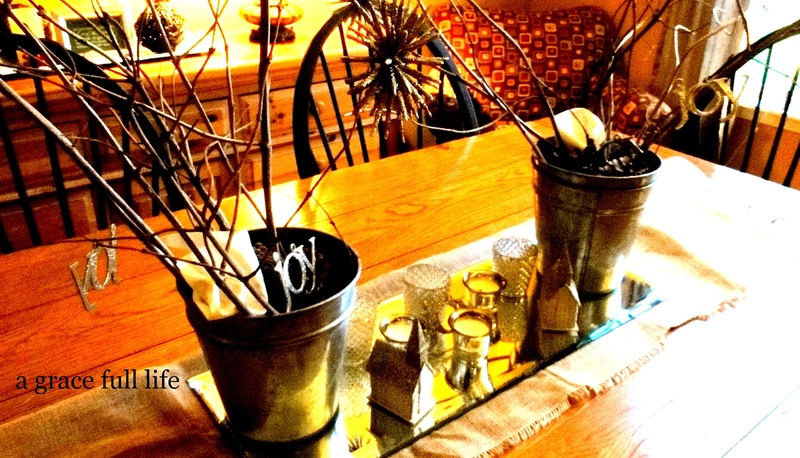 Goes to show how you can create a gorgeous table on a budget. Thanks for sharing and linking up to the Dollar tree party. Love it. Particularly those little churches. 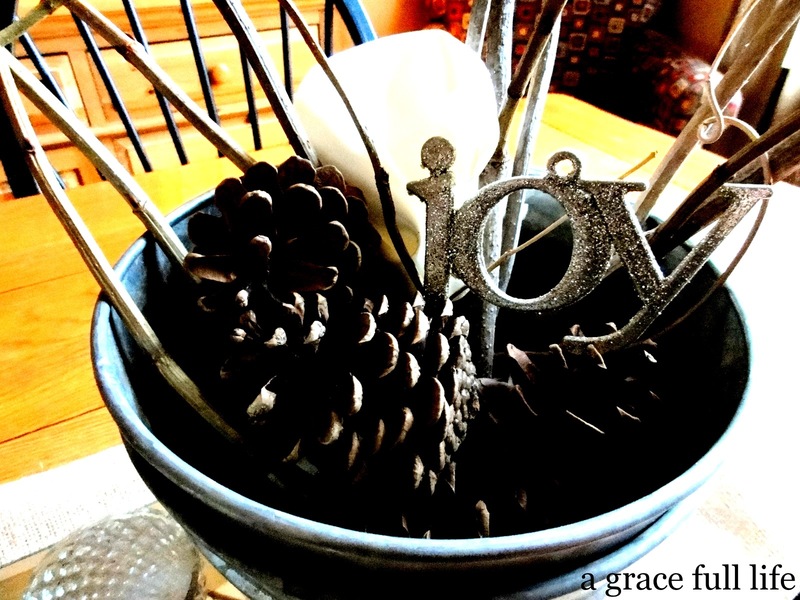 I host a weekly blogging party called Seasonal Sundays. I'd love to have you link! YOU HAVE A STORE NAMED DOLLARAMA?? I need to go there. Kari I am obsessed with houses but I don’t have any room to display them. I love your little churches and the way they are displayed. Also your runner is very DIY and practical especially with the mirror.